You can easily connect any iPhone, iPad, or iPod touch to a TV screen or even many projectors with the help of a wired connector adapter and HDMI cable. As long as the recipient TV, display, or projector has an HDMI input port, you can mirror the iPhone or iPad display directly to that screen. This is great for presentations, demonstrations, watching videos or movies, and so much more. 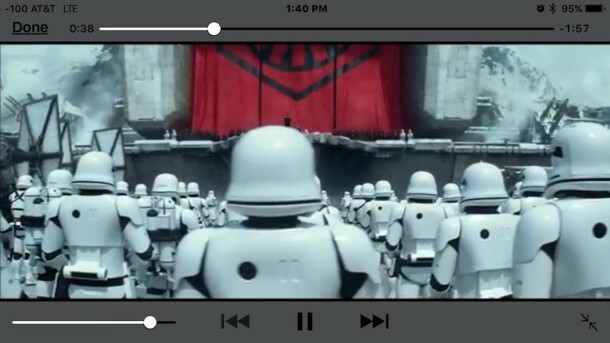 The output video can be a maximum of 1080p HDTV resolution, and yes both video and audio are transmitted, mirrored from iOS to the TV screen. If you don’t want to use HDMI, you can also use a wireless method with AirPlay as described here too. This is what the Lightning to HDMI cable looks like, it also has a lightning port on there if you wish to charge an iOS device or have it connected to a power source while in use. 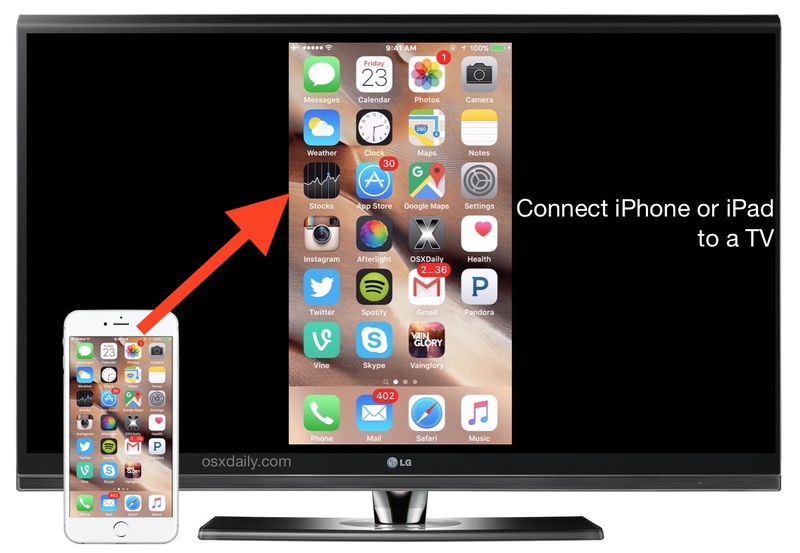 Once you have all the hardware, the remaining setup is extremely easy to get the iPhone or iPad connected to a TV screen. 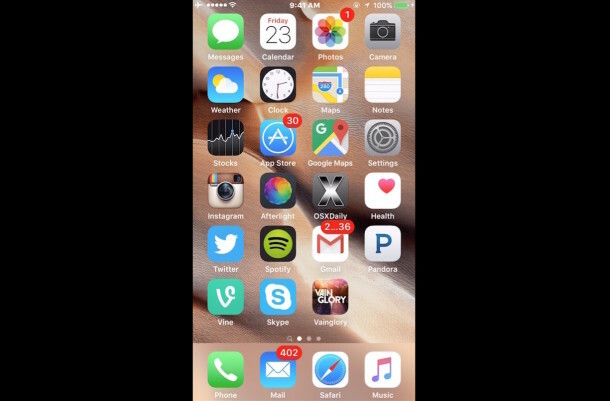 You can now use iOS as usual, with the screen mirrored to the other display or TV. Play a video, game, run through a presentation, show a demonstration, play a slideshow, share pictures on a larger screen, whatever you want to do on the iOS device is now in full screen on the TV. 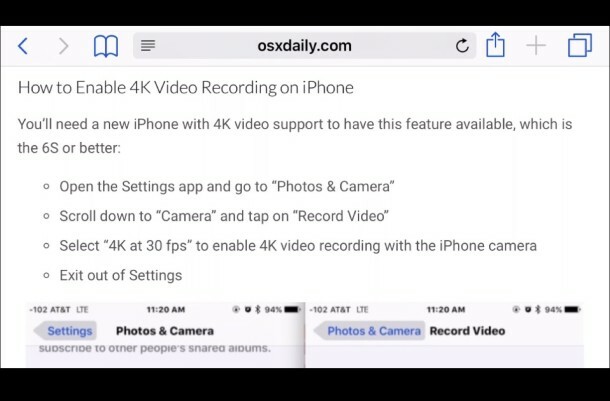 It also helps with apps that support the horizontal / widescreen format too, like Safari. Without rotating into horizontal mode, the picture will simply display on the TV or projector smaller than it would otherwise if widescreen is possible, like playing a movie. So while using a wired connection and HDMI cable is less fancy than using wireless like AirPlay, there’s also much less troubleshooting required since you basically just connect the cables and you’re good to go. You can go aboutconnecting a Mac to a TV in a similar cabled fashion, which is equally as useful, though doing that requires a different adapter than what is necessary for connecting an iOS device to a TV screen as we’ve covered here. Of course, using a cabled solution may not be as fancy as mirroring a display wirelessly with AirPlay, but it works nearly flawlessly and there’s so little setup involved that it can be great solution for those who don’t mind the wired connection. If you have an Apple TV and want to use the AirPlay solution instead, you can read more about that here. 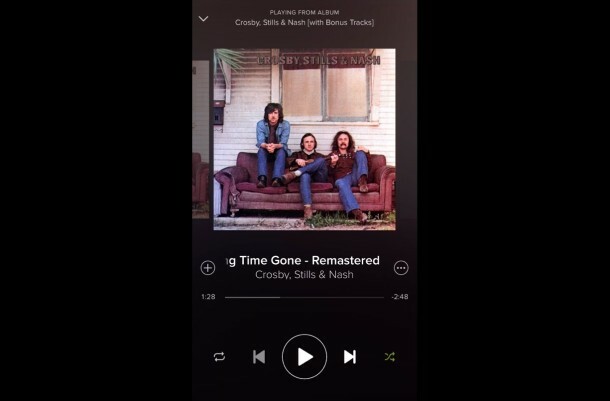 Chromecast is another option that is pretty easy to use (and cheaper than Apple TV). These cables work great, and if you use them often for presentations or at work they are a must-have for iPhone and iPad accessories. But for the average person I don’t know because of the cost, when you are close to other options price wise, like Apple TV and Chromecast. I mean, $50 for a adapter cable? You can buy an Apple TV with AirPlay for $99 ($149 for the newer one since they always up the price on new stuff), but for an adapter, you are getting every nickel and dime taken by for an adapter that should cost $10. Connecting the iPod Touch to a TV will not impact the free storage on the device. Using the lightening cord to hdmi used to work now I get an error message saying it’s not available. Did Apple or xfinity change something? Any way around this without Apple TV? Try rebooting the iPhone or iPad, and turning the TV off and on again. You can also try to switch the HDMI port to another one. It’s possible the HDMI cable or the adapter itself is failing in terms of hardware too, especially if it has been abused or torn or is fraying, but there has been nothing changed and the ability should work with supported iOS hardware and the HDMI. hello . i just updated my i-phone 4s to iOS 9.1.2 and now when i connect it to my tv whit the hdmi cable it comes up on my phone (this item is not supported by this phone) when i had iOS 7 it worked fine , any ideas how i can watch stuff from my phone on tv again ? I have the Lightning adaptor, everything connected to my Sony tv via iPhone (iOS updated), the correct HDMI matched to input and no sound. Can you help ? Try plugging in ear phones and adjust volume . let me know if successful or not . I have unlimited data for movie streaming on my iPhone plan but they say it is not licensed for any other screen. If I want to spare my eyesight and connect my phone via HDMI and Lightning Adaptor to my TV, will my phone provider be able to tell and charge me for additional usage? Not Apple TV, just straight manual connection. I’ve had the same problem as above, I have connected the cables correctly to my iPad/iPhone and tv and the images work fine but there is no sound? It works fine on my fiends TVs and in the Apple Store so I was wondering could it be my tv that is the problem? I want use Netflix through my iPhone to my headrest monitors. Headrest only have a 3.5m AC in. Can it be done? I purchased the apple hdmi adaptor and a new 32 in tv with hdmi ports. Hooked up my iphone 6s with ios 10 and it says there is no device hooked up. I do get iphone screen mirrored on the tv and when i stream directv i get sound but no video. anything im missing? When I try using the hdmi with DIRECTV playing on my phone, I can only get sound to come out of the tv while video plays on my phone. Thoughts? Netflix downloads play seamlessly. Headphones or whatever audio output to stereo from the Mac will improve sound quality. Wifi downloads from netflix don’t waste your phone’s data. All great but No sound as above. Has anyone figured it out? Headphones nope! Do these still work, if so is there any delay? When I connect my iphone se via the hdmi/lightning cable, the screen does not want to work properly. I have to decide on the website I want to view and ‘then’ plug in my cable in. Any ideas? Answer- try and flip the lightning adaptor cable entrance to the phone (has two sides) both sides does enter correctly but one side doesn’t connect the the volume to the tv, once I flip the connector of cable to the other side and connect to the phone it work fine. Ran into the no sound issue using the iPhone to HDMI adapter. I went into my TV settings (Panasonic), Audio > Advanced Audio > switched the sound setting on my input from HDMI to digital. That fixed it for me. omg i use android. just plug in any cable and it works, no use for this kind of explanation. Is this the apple-world? We bought one to watch Netflix on our tv. But we can’t get the screen to go side ways. It only stays length ways even though my phone is sideways. Why wo t it change on the tv. This approach (lighting HDMI) for my iPhone 7 Plus works flawlessly on my TCL TVs but I recently bought a VIORE TV with a HDMI port and nothing comes out. Suggestions? So you only get sound when you watch SD films, but not HD films. I’m sure those Apple people really had some thoughts about this. not. We are trying to connect the iPhone 8plus to tv using the hdmi cable and adapter. Not a connection to tv. Tried both HDMI 1 and 2 . Suggestions? My TV’s are vertical how do i get it to mirror correctly? I am only getting sound through the tv no picture .